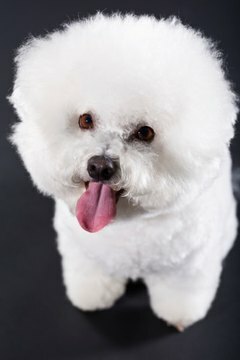 With their glistening white bouffants and perfectly round heads, bichon frises look like walking cotton balls when properly cared for. However, when neglected, these happy-go-lucky dogs suffer in both image and health. Particularly problematic are their ears, which hang down in long curls, framing their face. Like the rest of the bichon’s locks, this hair doesn’t shed. Cleaning the hair around the ears, and the ears themselves, is a must. Otherwise, the neglected hair can block the ear canal, trapping in moisture and bacteria, which can lead to infection. Grab three or four long hairs that lead into the dog's ear with tweezers or a hemostat. Yank the hairs firmly to remove them. Pluck a few hairs out at a time until the ear canal is mostly free of hair. Dip a cotton swab in rubbing alcohol. Place the swab in as far as it will go without using force and gently twirl it around in the ear, replacing it with a clean swab as needed. Spread the rubbing alcohol around until the cotton swab comes out clean when pulled from the ear. Hold the tip of a bacterium-inhibiting powder bottle an inch from the dog's ear and squeeze powder into it. Clean out your dog's ears at least once a month or whenever you bathe it. If you are not comfortable cleaning its ears out yourself, have a dog groomer do it. Do not probe too deeply into the ear with the tweezers, hemostat or cotton swab. If you notice heavy wax buildup or an odor in the dog's ears, or if the dog is scratching its ears or shaking its head excessively, consult a veterinarian.